A lovely mum I know who has raised a daughter with cerebral palsy, recently recommended Robert Jourdain’s book Music, the Brain and Ecstacy, published by Harper (1997) and as a paperback by Quill (2002). Jordain explores what is going on inside the human mind and body when we listen to music. If you have a mildly philosophical way of approaching the world; if you are fascinated by music – what it is, how it effects us, and why; or if you are simply interested in the things we have learned about the way the human brain works, you will probably find this book quite intriguing. I have never been a huge music fan, yet even I can point to moments of physical and emotional effect – joy, sadness, inspiration, love – that have been provoked in me by some fragment of music. I’m sure you can too. Jordain concludes that our brains are active in a unique way when our ears hear musical patterns and melodies; stimulating muscles, unlocking memories, releasing those little built-in party-drug hormones, endorphins, and generally flipping switches and turning lights on and off all along the neural wiring inside our bodies. What most interests me however, are the effects music can have on those who live with neurological disorders. He quotes famous anecdotes from Awakenings doctor, Oliver Sacks about the way Parkinson’s sufferers are sometimes liberated by music. He also delves into questions of human pleasure and pain as they relate to the way our bodies respond to music. 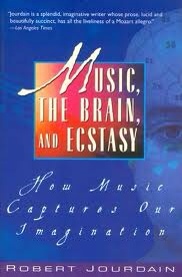 Because of the way the human brain and body are wired, music flows through the whole system. He writes, ‘It seems we use our musculatures to represent music, modelling the features of musical patterns by means of physical movements large and small.’ We don’t necessarily bop up and down when listening to music, he notes, though often we do; but we are probably dancing on the inside, so to speak. This raises all sorts of questions for me as the father of a son whose cerebral palsy from birth skews the way his brain and body talk, or don’t talk, to each other. He is quadriplegic. He has little control of his musculature, and, now aged 15, has never walked, danced, swum, skipped, run or jumped. He has never developed balance, operated machinery, bumped into things, dropped things or picked them up. In short he has never moved through the day like you or I have, employing those thousand little physical actions and reactions that humans do without conscious thought. Does this mean his palsied brain and body respond differently to music? He enjoys it. He knows what he likes and appreciates a variety of musical styles. But does a brain that cannot represent music in his body the way Jordain talks about do something else with it, or nothing? Could it actually create psychic pain or frustration when one’s brain cannot access the neural pathways it seeks when it hears musical patterns? Could certain genres of music effect him more than others? Are moments of musical ‘ecstacy’ possible form him? I would love to read the opinions of an expert on the neurology of cerebral palsy. Is it flippant to say that these questions, and many others, are beginning to hurt my brain? This book is an interesting read and throws light on some of the curious aspects of our humanity. ~ by Garry on March 1, 2012. Definitely going to get a copy of this book and read it. Music is Eli’s most favorite thing in the whole world (maybe a close second behind his Dad 🙂 ). Kevin will find the read fascinating too. My daughter loves music too. Whilst she can move a little and does sway with the music perhaps the strong attraction is that she can “dance on the inside” and that feeling is fantastic – well I certainly hope so. When he was very little, Christopher did some music ‘therapy’ designed to help with brain development – who knows whether it made any difference – but maybe music is potentially therapeutic for all of us as all those little neurons fire away to the rhythm and melody. I found some of the book a little tedious, as I am not really very interested in the history and development of music as an art form, and not being a musician, some of the detail went over my head, but the chapter on ecstacy was especially interesting. Vicky, I agree, it is nice to think that the music might be giving much more pleasure than it seems.